A tooth replacement solution that feels and functions naturally! And, guess what? You can afford it! We offer FINANCING OPTIONS to fit almost any budget. For partial or full-mouth teeth replacement. At Robson Crossing Dentistry, we can place and restore your implants right here in our office, with out referring you to anyone else! Plus, we have 3D Cone Beam Diagnostic Technology, which allows us to get a better picture of your existing bone mass. You should never get a dental implant without have a 3D image completed first! Financing Available! You can afford to eat the foods you want to eat! This is a ideal if you are missing a single tooth. A single implant is placed and a crown restoration is then attached on top of the implant to replace the missing tooth. This is a full crown that is attached, not a tooth cap like what is normally used to cover a damaged tooth. A dental implant, if properly maintained, can last a lifetime. It is a much more reliable option than a bridge or flipper. 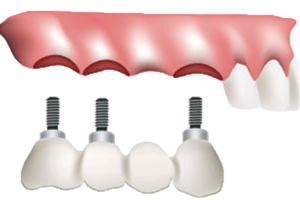 Implant-supported bridges are similar to traditional bridges, but are supported by implants rather than the patient’s adjacent teeth. 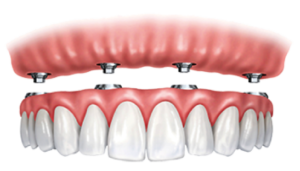 Implant-supported bridges are used when the patient is missing three or more teeth in a row. Implant-supported bridges are stronger, more durable, and can withstand greater bite pressure than traditional bridges. We can place as few as four implants (per arch) in strategic locations and angles. 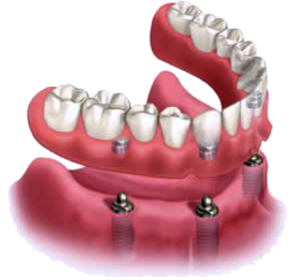 In some cases, we recommend six to eight implants per arch for additional stability. We can extract irreversibly damaged teeth, surgically place dental implant posts and provide you with functioning and natural-looking teeth in one day. Although remarkably expeditious, the procedure provides an effective, efficient and long-lasting solution for missing teeth. Dental implants are made of durable titanium, a non-corrosive, body-friendly, long-lasting metal. Implants are subject to the same periodontic issues as natural teeth, however, and require good oral care (daily brushing and flossing) and regular professional cleanings. 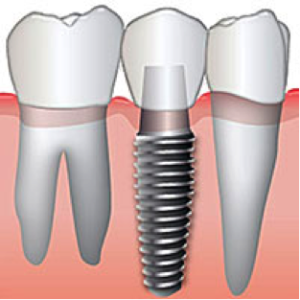 Once an implant is placed, most patients can’t tell the difference between their natural teeth and the implant tooth. Not only do the implants blend-in with their natural teeth, they can eat with full chewing power, and can brush and floss normally, as well. Bone in the jaw deteriorates where there is no tooth. This is because the bone requires the pressure and stimulation of chewing to maintain its density. Implants act as natural teeth and provide that necessary stimulation. The gap caused by a missing tooth can destabilize adjacent teeth, causing them to shift towards the gap. This pulls your teeth out of position and can affect your bite and your ability to chew. Dental implants fill in the gap left by a missing tooth and prevent this from occurring.